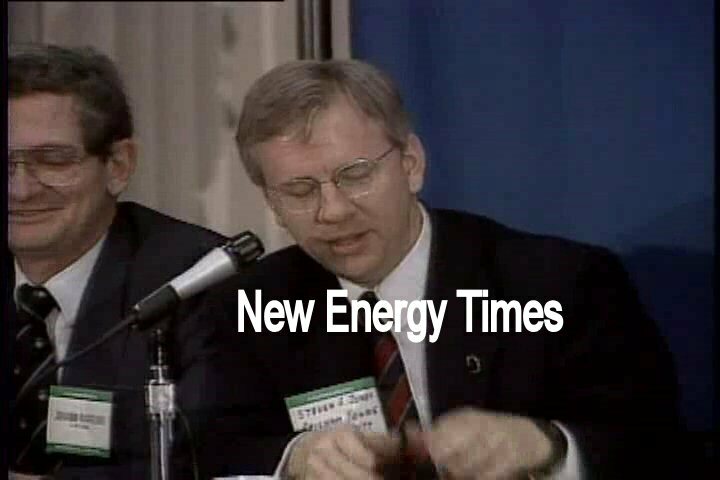 In March 1989, electrochemists Martin Fleischmann and B. Stanley Pons, working at the University of Utah, pre-empted Steven Earl Jones, a physicist at Brigham Young University, and announced their "fusion" claim before he did, beating Jones to the punch. Fleischmann and Pons were also concerned that Jones was trying to pirate their discovery. At the press conference, Jones addressed the media. 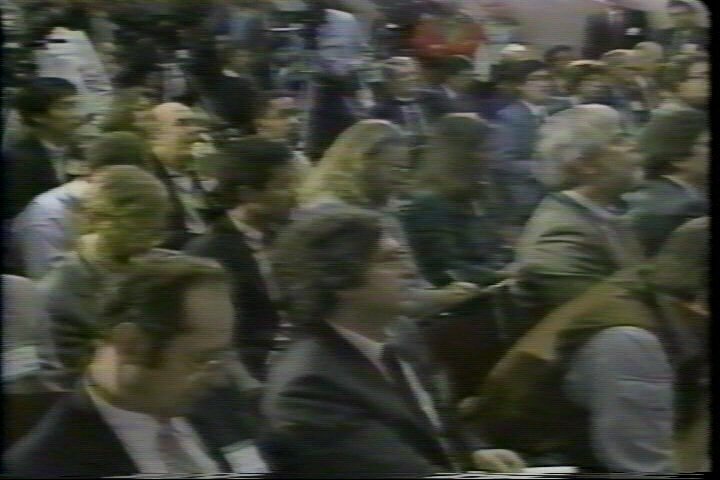 Reporters at 10 a.m. May 2, 1989, APS "cold fusion" press conference. 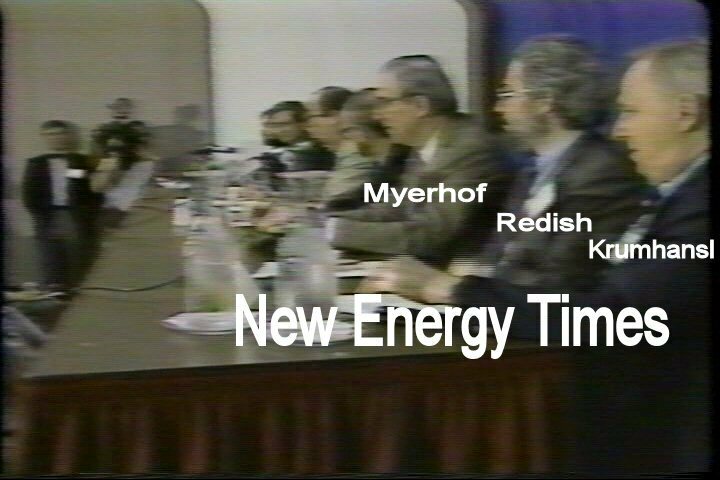 Video frame showing panel members: Walter E. Myerhof, Stanford University; Edward F. "Joe" Redish, incoming chairman of the few-body APS topical group, University of Maryland; James Krumhansl, president of the American Physical Society, Cornell University. 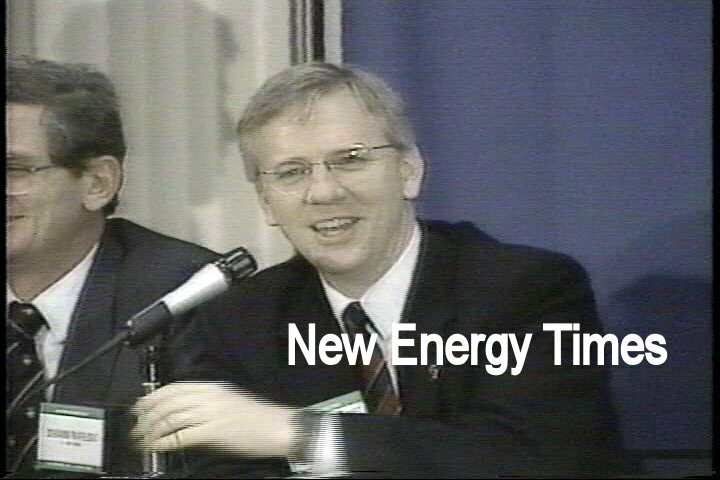 Jones, right, appears happy as he begins to ask the physicists on the panel to vote on the credibility of Fleischmann and Pons' claim. His collaborator, Johann Rafelski, is chuckling. 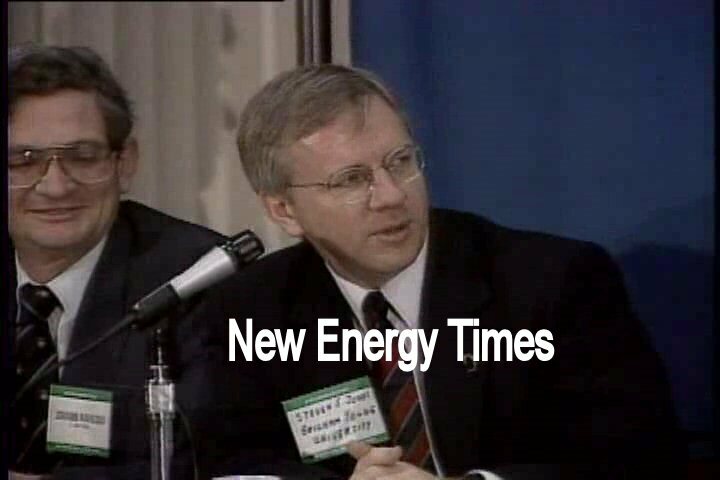 The night before, Jones and Rafelski, two of the four invited speakers to the "cold fusion" special session, spoke about their version of "cold fusion." The two other invited speakers were Nathan Lewis and Steven Koonin of Caltech. Lewis gave a press conference at 5 p.m. and at 7:30 p.m. spoke at the scientific session. He and Koonin harshly criticized Fleischmann and Pons during the scientific session. Jones' call for a vote offered the news media a handy conclusion with which to bring Fleischmann and Pons' claim and the ensuing conflict to a close. In this frame, Jones is no longer smiling. He looks down the row of panelists and asks them whether they are convinced that Fleischmann and Pons did not attain fusion: "How many think we can rule that out at this time?" Before Jones has finished asking the question, he begins to raise his hand, signaling his vote to the other physicists. Rafelski continues to find Jones' call for a vote amusing. Jones has his hand raised high and is looking at the other physicists for their vote. 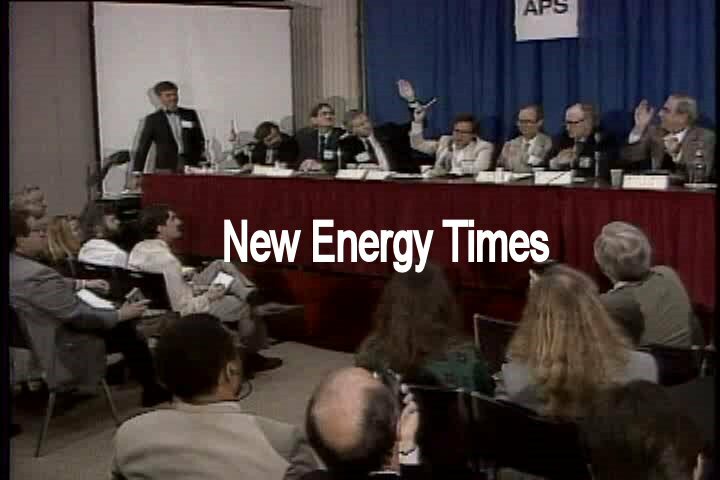 From left, Moshe Gai, Yale University; Johann Rafelski, Arizona State University; Steven Earl Jones, Brigham Young University; Steven Koonin, Caltech and University of California Santa Barbara; Richard N. Boyd, Ohio State; Douglas Morrison, CERN; Walter E. Myerhof, Stanford University. Steven Koonin is the first to decide. He begins to raise his hand. The others need a moment to think, and perhaps watch their peers. Moshe Gai cautiously raises his pen. The others look on. Myerhof, who has been watching Jones the whole time, is next to raise his hand. Morrison had also been watching Jones. He has decided, and he begins to look away from Jones and raise his hand. Richard N. Boyd cautiously raises his hand. All but Rafelski raise their hands. Krumhansl and Redish are out of this frame, but other video clips show their raised hands. New York Times: "vote by eight of nine physicists calling the Utah experiment dead." Associated Press: "In an informal show of hands, the scientists on a panel at the American Physical Society meeting Tuesday voted 8-1 that they were 95 percent confident the excess heat was not produced by nuclear fusion." ABC-TV: "At this point, the bulk of scientific opinion is skeptical that cold fusion exists as Pons and Fleischmann reported it." Jones also took the opportunity with the voting procedure to promote his own work. Associated Press: "However, the panel also voted 6-3 against ruling out that experiments in Utah and elsewhere had produced neutrons."